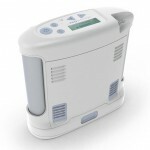 Introducing the next innovation to portable oxygen delivery: the Inogen One G4, capable of full 24/7 oxygen delivery in an unbelievably small package!The Inogen One G4 is officially the smallest and lightest portable oxygen concentrator ever released by Inogen. Weighing in at 1.27kg with the single battery, the Inogen One G4 is more than 40% lighter than the Inogen One G3 and it’s about half the size! It even weighs less than some of the most commonly used portable oxygen tanks. 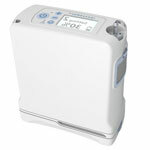 The Inogen One G3 is a single solution portable oxygen concentrator, is small, lightweight, quiet, energy efficient, and very easy to use at home or travelling. The advanced motor provides Pulse Dose oxygen therapy efficiently and effectively during all phases of daily activity, during day and night. Each Inogen One G3 Bundle comes complete with AC and DC cords and integrated batteries to create an ideal solution for active oxygen therapy users 24-hours a day 7-days a week!